The staff members at Lawndale Veterinary Hospital are an amazing team! Each and every person is essential in ensuring all of our patients and pet owners receive exceptional care and service. You can meet our various team members by clicking on the links below. Also, each month we recognize a team member for exhibiting excellent customer service skills – be sure to check out their bios as well! Favorite Thing About Lawndale: The staff she works with, the doctors, and seeing reptiles that clients bring to the clinic. What Her Teammates Say: Steph is an incredibly dedicated, dependable, loyal, and reliable team member. She shows up to work, and she works really hard while she’s here. She is always ready to jump in and lend a helping hand. Steph is also a huge help whenever we have inclement weather – somehow she always finds a way to get to the clinic to be here for the pets. Caring for all the animals comes naturally to Steph – you can tell she loves what she does. 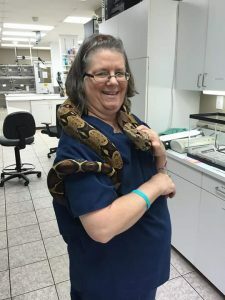 While she loves all the dogs and cats, she also thoroughly enjoys it when we have a reptile visit the clinic. Steph is the employee who has worked at Lawndale the longest, and we are so lucky to have her. Steph is truly an essential part of the Lawndale Veterinary Hospital team – her devotion to and love for Lawndale shine through loud and clear! Hobbies: Steph enjoys volunteering at the Greensboro Science Center, SciFi Cons, Cruising, and she is a breast cancer survivor!